Just last week I picked up the audio version of 102 Minutes: The Untold Story of the Fight to Survive Inside the Twin Towers. It was at the library and looked interesting. It’s fabulous and tells the story from the perspective of those inside the towers. The minutes before they were hit, and the 102 minutes following. Every detail is exposed including the thoughts of survivors, their discussions in the tower, the decisions they made, and the radio messages. I can’t recommend it enough. Especially the audio version. Related: Amazon link and a NY Times article written by the author (might require login). Apparently the authors work for the New York Times. 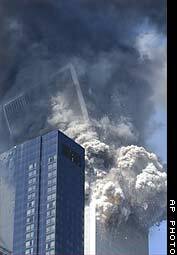 Here’s an interesting engineering perspective about what caused the towers to fall. At the bottom of that page is a link to a pdf that is pretty cool, too. Another fabulous article. There are a lot of theories about what caused the WTC collapse and I’m not really saying this is how it happened just that the book was really interesting.